The Morning of the Operation - what to do the morning of the operation, including "nothing by mouth"
Post-operative guidelines - what to do about bathing, swimming, traveling, flying, returning to day care, etc. Ear disease is the cause of many neurological complication(s) such as meningitis, facial paralysis, etc. Eustachian tube dysfunction leads to reduced air pressure (negative pressure) behind the eardrum in the middle ear space. Ear tubes serve as "pressure equalization" tubes (PE tubes) and restore normal air pressures to the middle ear space. By ventilating the space behind the eardrum, the ear stops making fluid (which impairs hearing and serves as a culture medium for bacteria). Placing ear tubes as "drains" or "vents" in the eardrum is similar to placing tubes or drains in other areas in the body which accumulate unwanted or harmful fluid. Before age 6 months: most children rely upon maternal antibodies for protection against infection. After age 6 months, maternal antibodies become depleted, and children must rely upon their own immune system for protection. However, their immune system may be immature and may not be able to provide adequate protection. Daycare environments, exposure to second hand smoke, and older siblings who serve as "infection carriers" are all factors that contribute to ear infections. The 6 month-3year age group often has "symptomatic" ear infections with fever, crying, irritability, pulling of the ears, inability to sleep, loss of appetite, lethargy, and failure to thrive. Beginning at age 3-4 yrs: immune function seems to improve, Eustachian tube function is maturing, and head size is enlarging. As a result, the incidence of ear infection decreases. Beginning at age 4 yrs: children enter preschool and are exposed to many more children and infections in general. The ear infection and ear fluid rate increases. In contrast to younger children, the 4-7 year old child with ear fluid is often "asymptomatic". There may be sporadic acute ear infections with symptoms of fever, ear pain, etc. However, many children will remain asymptomatic except for hearing loss which is usually noticed by parents and teachers or is detected by failing a school hearing test screening. A T-Tube is similar to a Triune tube (above) and is considered to be a longer term tube. A T-tube has two flanges and is composed of medical grade silastic. T-tubes are inserted when long-term ventilation is required. 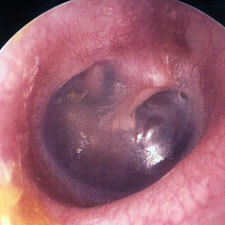 T-tubes usually remain in the eardrum for 24 months or longer. If T-tubes are retained and are not spontaneously ejected, they may be removed and the eardrum may be repaired with a fat graft from the earlobe or other tissue (fascia or cartilage). Removal of the adenoids (primary adenoidectomy) is often recommended along with the insertion of ear tubes. The adenoids are located directly behind the nose in the roof of the throat (nasopharynx) and surround the opening of the Eustachian tube. Adenoid tissue is composed of B-cells which is a special type of immune system cell. B-cells make antibodies for us. However, we have many other B-cells in the body to perform the same function (300 lymph nodes in our neck). The adenoids function during childhood and then usually disappear by age 20. The purpose of the adenoids is to make antibodies (immunoglobulins). However, the adenoids often become colonized with harmful bacteria (Biofilm formation) that contribute to repeated infections of the ears and sinuses. Removal of the adenoids decreases the bacterial focus in the back of the nose and throat and helps to significantly reduce recurrent ear and sinus infections (40% reduction). It is important to realize that adenoids and tonsils are different and are not located in the same place. Adenoids are located behind the nose in the very top of the throat. Tonsils are located in the lower throat on either side of the tongue. Although tonsils and adenoids are often removed during the same operation (tonsillectomy & adenoidectomy), they may be removed separately. When adenoids are removed to help reduce ear infections, the tonsils are usually not removed. Removal of the adenoids alone (without removal of the tonsils) is relatively painless and seldom causes more than one day of throat discomfort. After adenoids are removed, it is common to have both temporary mouth odor and snoring for approximately one week. Because of bleeding concerns, your child should not receive any medications that contain either ibuprofen or aspirin for one week prior to having an adenoidectomy. Children under 18 years of age should not be given aspirin, especially while experiencing viral infections, as aspirin may contribute to developing a condition known as "Reye's Syndrome". Ear tube procedures are generally performed at an outpatient surgery facility (the SCA Surgical Center of Greensboro, 1211 Virginia St. or the Cone Day Surgery Center, 1127 N. Church St. directly across from our office) using general inhalation (gas) anesthesia administered through a plastic face mask. An intravenous line (IV) and intubation (placing a tube through the vocal cords and into the trachea) are generally not necessary for ear tube only procedures. IV's and intubation are used when an adenoidectomy is performed. Complications are unlikely and are rare, but they are possible, even during a brief mask anesthesia. However, the expected benefits from the procedure usually outweigh the risks inherent in performing the general anesthesia. The day before the operation, regular food is allowed until 12 midnight. After 12 midnight, nothing at all is to be placed in your child's mouth or eaten, i.e. no food or drink, no gum chewing, no crackers, no gummy bears, etc. Eating, drinking, and chewing gum causes the stomach to secrete gastric acid that is harmful to the lungs if vomited during or after a general anesthetic. If your child has not been NPO (nothing by mouth) after 12 midnight, the anesthesiologist will cancel the anesthesia, and the procedure will need to be rescheduled. The morning of the operation, the anesthesiologist will review the anesthesia procedures and risks with you and will answer any anesthesia related questions. Please let the anesthesiologist know if anyone in the family has had any problems with anesthesia, particularly any high fevers or a condition called "malignant hyperthermia". Also, notify them of any loose teeth, allergies to medicines or latex, other previous special healthcare problems, or recent upper or lower respiratory tract infections. Laboratory studies are usually not necessary for ear tube procedures but may be ordered by your surgeon if indicated. For children, the procedure is brief and lasts approximately 15 minutes. The anesthesia is performed by a certified registered nurse anesthetist (CRNA) under the guidance of an anesthesiologist (MD). Full vital sign monitoring is done. With rare exceptions, intravenous lines (IV's) and endotracheal tubes (breathing tubes) are not necessary. After the procedure, less than 30 minutes is usually spent in a post-anesthesia recovery room (PACU) before going home the same day. Dr. Kraus will be performing the operation himself. The procedure is brief and usually lasts less than 15 minutes. There is no pain involved during the procedure. Minimal postoperative pain may be experienced. Tylenol™ may be used but is usually not necessary. Postoperative drops may cause some fussiness or irritability, but this is usually temporary and does not require pain medications. 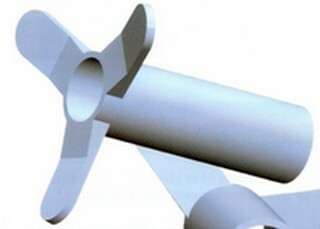 Various types of ear tubes are used (Paparella Type I or Type II, T-Tubes, etc.). All tubes are small and are made of medical grade materials such as silastic, polyethylene, Teflon™, etc. Most ear tubes are blue, green, white, or metallic in color. They may been seen by your primary care physician or pediatrician during ear examinations. During the ear tube operation, a small incision is made in the eardrum. The tube is carefully inserted through the eardrum. A portion of the tube is positioned on the inside of the eardrum, and a portion of the tube is positioned on the outside of the eardrum. The shape of the tube and the nature of the eardrum hold the tube in place. Ear drops will be prescribed for postoperative use, usually for 7 days. After ear tubes are inserted, do not place any ear drops in the ears that have not been prescribed or ok'ed by your ear surgeon. Some of the ear drops that you may have used prior to the operation may be harmful to the ear and may cause significant pain, such as drops used to "numb" the ear (Auralgen™, etc.). Do not place any ear drops in the ear that contain alcohol, hydrogen peroxide, oil, etc. Do not use ear candles, ever! If infection is present, antibiotics may be prescribed after the procedure. Bacteria resistant to multiple antibiotics may be present and are sometimes difficult to treat. Special ear drops and oral antibiotics may be necessary. Children may experience some brief nausea or vomiting after the procedure from the anesthesia, sleep longer during their afternoon nap, or experience irritability for several hours. Most children will have returned to their normal state by 6 pm. Inhaled anesthetic gases are usually gone from the body within six hours after being administered. Children may return to Mother's Morning Out programs, daycare, or school the next morning and may resume their normal activities. Older children may return to normal sports activities, including contact sports. Regular follow-up visits to the office will be necessary, beginning approximately 4 weeks after the procedure. Ear tubes are usually checked every 6 months until they spontaneously eject or are removed. Your primary care physician should be able to see the tubes during well child visits and routine examinations. Ear tubes usually remain in place for 6-12 months before being spontaneously ejected from the eardrum. Once ejected, they fall into the ear canal, become lodged in earwax, and are removed from the ear canal during follow-up office visits. Never attempt to remove ear tubes yourself. After ear tubes are inserted, it is not uncommon for the ear(s) to drain for awhile, especially during upper respiratory infections. It takes approximately three months for the lining of the middle ear to return to normal after ear tubes are inserted. If postoperative drainage occurs, ear tubes are very beneficial as they serve as "medicine delivery tubes" to facilitate ear drops being placed in the middle ear. Postoperative ear drainage is usually treated at home by wiping away the drainage with a moist washcloth and placing ear drops in the draining ear, 3 times/day, for 3 days. Again, only use ear drops that have been prescribed or ok'ed by your ear surgeon. After putting the drops in the ear canal, "pump" the drops into the ear by pushing three times on the small bump of cartilage in front of the ear opening (the tragus) to cover the ear opening. The tragus will cover the ear opening like a "trap door" and provide a seal that will produce a small amount of gentle positive pressure in the ear canal. This maneuver helps to pump the drops through the tube and into the middle ear. If the drainage persists or if there is fever greater than 102F, an office visit may be necessary to remove the fluid, clean the ear, obtain a culture, administer ear drops, and place an ear wick. Please call our office nurses for guidance if you have any questions, (336) 273-9932. When a tube ejects, it is very rare for it to "fall" behind the eardrum (into the middle ear space) instead of falling into the ear canal. If it does, the tube can be removed with another brief operation without causing harm. Eardrums usually heal without complication. In less than 1 out of 200 cases, a non-healing perforation (hole in the eardrum) may occur. If a perforation occurs and fails to heal spontaneously, it can be repaired at a later date. Sometimes, T-Tubes or Triune tubes are recommended when a long-term tube is needed. T-Tubes and Triune tubes usually remain in place for up to 2-3 years. Some T-Tubes or Triune tubes may remain in place for over 25 years. Alternatively, they may eject from the eardrum spontaneously just like standard tubes. If T-Tubes or Triune tubes are placed and they do not fall out spontaneously, it may be necessary to remove the tubes in the operating room at a later date (when the child is 6-7 years of age) and repair the eardrum with small fat grafts that are harvested from the earlobe. Statistically at The Ear Center, 2/3 children will require one set of ear tubes. 1/3 children will require additional tubes. If a second set of tubes is necessary and the adenoids are still present, an adenoidectomy is usually recommended. In young children, bathing, shampooing hair, and swimming are permitted without using ear plugs. Children old enough to swim three (3) feet or deeper under the water or dive should wear ear plugs to prevent water exposure. Customized ear plugs for any child can be made in our office by one of our audiologists. Standard drugstore plugs (silicone plugs are preferred) may also be tried before making custom plugs. Hearing tests (audiograms) are performed both before and after tubes are inserted. Ear tubes do not cause eardrum scarring. Eardrum scarring is usually caused by repeated ear infections. Eardrum scarring consists of calcified collagen and is called "myringosclerosis". Routine bathing, washing hair, and swimming are permissible once ear tubes are placed. Older children and adults are asked to avoid diving deeper than three (3) feet under water without wearing drugstore plugs or special, custom ear plugs. Ear tubes cannot be dislodged by routine playing, running, falling, etc. After ear tubes are inserted, flying in airplanes is permissible. In fact, ear tubes automatically equalize ear pressures during flight and thus relieve ear pain associated with flying. Riding in an automobile on mountain trips is also more comfortable when tubes are in place. Drainage from the ears after ear tubes are inserted does not mean that the tubes have failed. Drainage means that the inflamed lining of the ear has not yet healed. In fact, ear tubes serve as "medicine delivery tubes" in such situations and can help ears to heal more quickly than if the tubes were not present. Ear tubes may not prevent every ear infection from occurring, and tubes cannot prevent viruses and bacteria from attacking the ear. However, ear tubes either eliminate or greatly reduce the recurrence of ear infections. Adults, as well as children, sometimes need to have ear tubes and may need them either for a short time or for many years. Some ears with non-functional Eustachian tubes may need to have tubes forever. Ear tubes designed to be "permanent" tubes are not recommended as they often become obstructed and need to be removed. T-tubes and Triune tubes are not permanent tubes but can stay in place for many years. T-tubes and Triune tubes can also spontaneously eject from the eardrum like other less long-term tubes. adulthood if Eustachian tube dysfunction continues. 1. Kadhim AL, Spilsbury K, Semmens JB, Coates HL, Lannigan FJ. Adenoidectomy for middle ear effusion: a study of 50,000 children over 24 years. Laryngoscope, 2007, 117(3), 427-433. 2. Lee MR, Pawlowski KS, Luong A, Furze AD, Roland PS. Biofilm presence in humans with chronic suppurative otitis media. Otolaryngol Head Neck Surg, 2009, 141(5), 567-571. 3. Winther B, Gross BC, Hendley JO, Early SV. Location of Bacterial biofilm in the mucus overlying the adenoid by light microscopy. Arch Otolaryngol Head Neck Surg, 2009, 135(12), 1239-1245. 4. Saylam G, Tatar E, Tatar I, Ozdek A, Korkmaz H. Association of adenoid surface biofilm formation and chronic otitis media with effusion. Arch Oto-HNS, 2010, 136(6); 550-555. 5. Carey JR, Adolwitz DG, et al. New patterns in the Otopathogens Causing Acute Otitis Media Six to Eight Years After Introduction of Pneumococcal Conjugate Vaccine. Pediatr Infect Dis J 2010;29 (April):304-309. 6. Saylam G, Tatar EC, et al. Association of Adenoid Surface Biofilm Formation and Chronic Otitis Media with Effusion. Arch Otolaryngol Head Neck Surg 2010;136 (June):550-555. 7. Bluestone CD, Swarts JD. Human Evolutionary History: Consequences for the Pathogenesis of Otitis Media. Otol HN Surg 2010;143(6):739-744. 8. Hong P, Smith N, Johnson LB, Corsten G. A Randomized Double-Blind Controlled Trial of Phosphorylcholine-Coated Tympanostomy Tube Versus Standard Tympanostomy Tube in Children with Recurrent Acute and Chronic Otitis Media. Laryngoscope 2011;121(1):214-219. 9. Antonelli PJ, Simpson EM, Ojano-Dirain C. Biofilm Formation on Silicone Tympanostomy Tubes with Polyvinylpyrrolidone Coating. Arch Oto HNS 2011; 137(1):19-23. 10. Boyd NH, Gottschall JA. Assessing the efficacy of tragal pumping: a randomized controlled trial. Otolaryngol Head Neck Surg 2011;144 (June):891-893. Tapiainen T, Kujala T, et al. Effect of antimicrobial treatment of acute otitis media on the daily disappearance of middle ear effusion: a placebo-controlled trial. JAMA Pediatr 2014,;168(July):635-641. Grindler DJ, Blank SJ, Schulz KA, et al. Impact of otitis media severity on children's quality of life. Otolaryngol HNS 2014;151(2):333-340. For any questions you may have concerning ear tubes or any other aspect of your child's ear care or hearing, please call our office at (336) 273-9932.